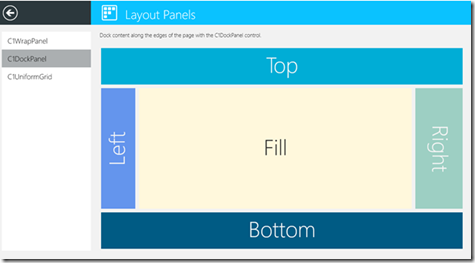 Control the flow and positioning of the content in your Windows Store apps with ComponentOne Layout Panels™ for WinRT XAML. Wrap content vertically or horizontally using C1WrapPanel. Dock content along the edges of the panel with C1DockPanel. Display content neatly in a grid using C1UniformGrid. Create flow type layouts that wrap content vertically or horizontally using the C1WrapPanel control. This can be very useful for handling flow of items when the user rotates your app into portrait orientation. Dock content along the top, left, right and bottom edges of the screen with the C1DockPanel control. Child elements are positioned in the dock panel in the order that they are declared in XAML. 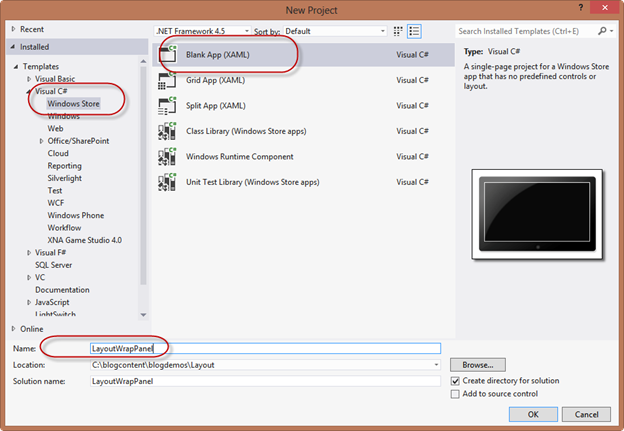 In this step you'll begin in Visual Studio to create a WinRT-style application using ComponentOne WrapPanel for WinRT XAML. Open MainPage.xaml if it isn't already open. In the next step, you'll add, style, and wrap several HyperlinkButtons. We're going to use simple HyperlinkButtons to show how content can be wrapped vertically or horizontally. This is the typical scenario to create a TagCloud view; very commonly used in Web applications. First, remove the Grid tags from your project. In the Visual Studio Toolbox, drag a C1WrapPanel control to the page. This adds the panel and a reference to the page. In the next step, you'll run the application. Click the Stop Debugging button to close the application. Notice how the buttons are stacked vertically. Congratulations! You have successfully completed the WrapPanel for WinRT XAML quick start.